Just 30 minutes North-East of Toronto, Ontario, Canada. Go North on Highway 404, until Green Lane. Note: For a variety of logistical and political reasons, the government signs direct you to exit earlier at Mulock Dr./Vivian Rd. This will also work but is slightly slower. Turn right (East) on to Mount Albert Rd. Go about 5 km to Kennedy Rd. Turn left (North) on to Kennedy Rd. Go about 3 km – Look for a sign on the right (East) side of the road. Total driving time from 401/404 – About 30 minutes. 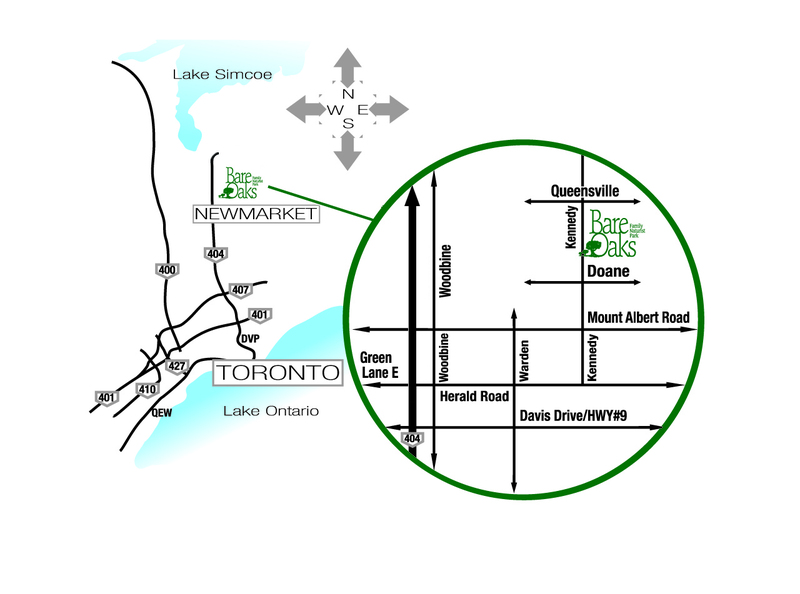 From the intersection of Hwy 400 and Hwy 88, go east for 14km, through Bradford, to the intersection of Yonge Street (Reg.Rd.1) and Green Lane (Reg.Rd.19). Turn left on Green Lane and go 4km to Woodbine Ave.
We have two level 2 (J1772) charging stations on the ChargePoint Network. Charging is free for members and registered visitors. While this is possible, it is certainly not ideal. Public transit is the environmentally-friendly way to go. Unfortunately, public transit in rural areas is difficult to maintain. We are proud members of the Ontario by Bike Network. There are many cycling trails in the area. We are located on Kennedy Road which is a popular cycling route. For your convenience, we have setup a group in CarPoolWorld.com where you can try and connect with other people who are visiting Bare Oaks. But please note that we have no connection with this service nor are we endorsing them in any way. Be prudent in your selection of drivers/passengers. Some of our members are willing to pick people up at the airport in exchange for some gas money and if it works with their schedule. Please contact the office. There is also the Holland Landing Airpark (CLA4) with a 597 metre paved runway in Holland Landing, Ontario (west of Bare Oaks) and a small grass-strip airport (CPB9) in Baldwin, Ontario (north of Bare Oaks).